Chevrolet’s eCOPO Camaro Concept. Photos courtesy Chevrolet. 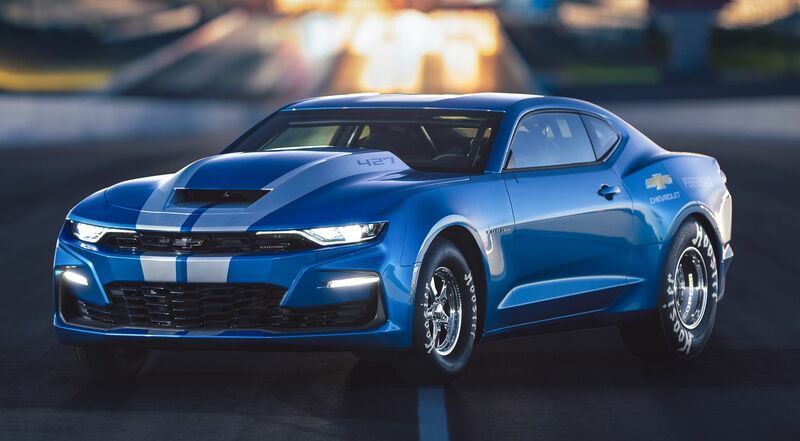 At this year’s SEMA Show, Chevrolet marked the 50th anniversary of the COPO Camaro with a limited run of racing-use-only 2019 COPO Camaros, wearing special anniversary graphics and paint that mirrors the Le Mans Blue of 1969. The bowtie brand also showed off a different strip-oriented Camaro – the eCOPO Camaro Race Car Concept – that isn’t yet for sale, but instead hints at an alternative high-performance future. 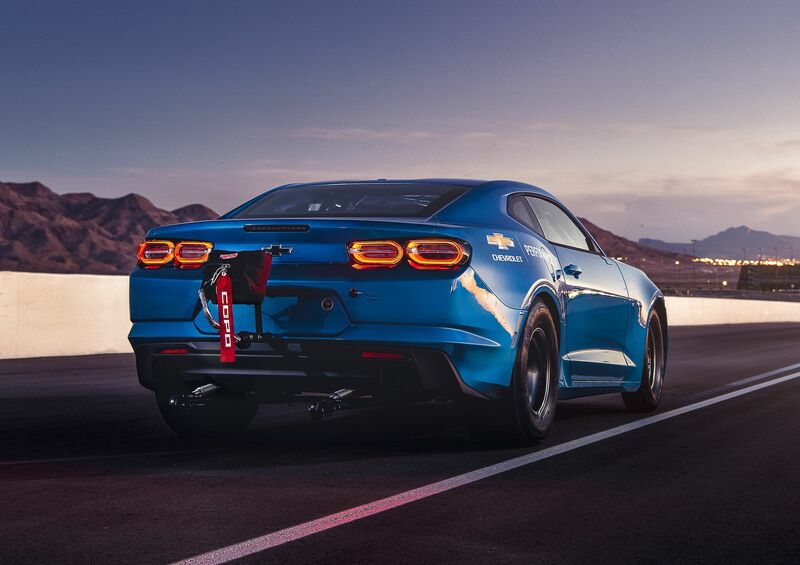 As the name implies, the eCOPO Camaro replaces the traditional V-8 engine with an electric motor, or, more accurately, a pair of BorgWarner HVH250-150 electric motor assemblies, bolted together to form a single unit. Each produces around 300-lb.ft. of torque, meaning the assembly sends roughly 600-lb.ft. of torque through the Turbo 400 automatic transmission to the solid rear axle, the same unit used on gas-powered COPO Camaros. Chevy’s existing electric cars, the Volt and the Bolt, send approximately 400 volts to the motor, but that simply would do for a race car application. Instead, GM developed the company’s first 800-volt battery, which is really a set of four 200-volt packs wired in series. Each weighs about 175 pounds, but this weight penalty is offset by the fact that they can be mounted to gain an advantage in weight distribution, and hence, traction. In the eCOPO Camaro, two battery packs are positioned in the rear seat area, while two are mounted in the trunk (one in the spare tire well and one above the rear axle). The net result is a 56-percent rear weight bias, which helps provide additional traction at launch. Things sometimes go wrong in racing, so the eCOPO features an integrated driveshaft tunnel between the rear seat battery modules, which are sealed off from the rest of the interior for added safety. In the trunk, the roll cage is extended to add another measure of protection for the batteries in the event of an impact. A Battery Management System continuously monitors critical voltages and temperatures within the packs, and is linked to a comprehensive safety system that monitors all electrical components in real time. In developing the eCOPO Camaro concept, Chevrolet turned to NHRA team Hancock and Lane Racing, which has ample experience with electric drag cars. They also enlisted the help of high school automotive technology teacher Patrick McCue, who (with the support of Hancock and Lane) built the battery-powered Shock and Awe 2003 Pontiac Firebird drag racer with his students from Bothell High School, located outside of Seattle, Washington. Over a dozen of McCue’s students pitched in to help build the eCOPO Camaro. 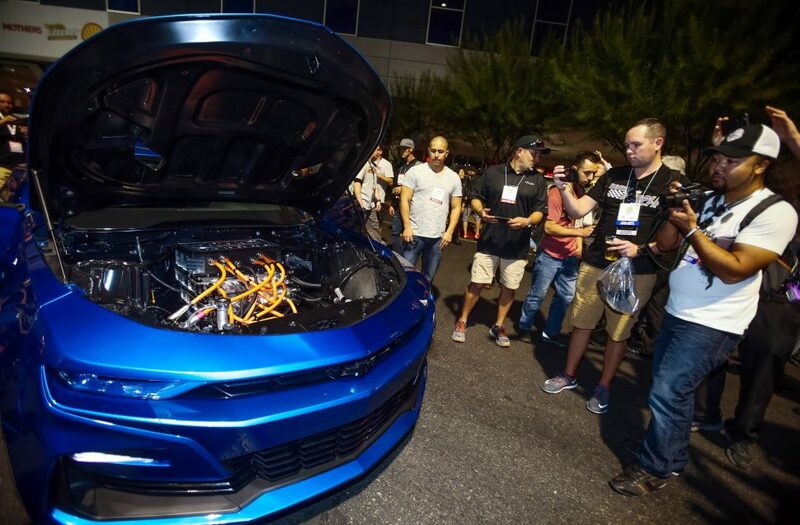 The eCOPO is revealed at SEMA. Photo by Isaac Brekken for Chevrolet. The battery-powered race car is still undergoing testing, but Chevy predicts E.T.s in the nine-second range. There are no plans to put the eCOPO Camaro concept into production, but that idea isn’t exactly being ruled out, either. The electric motor assembly has the same bellhousing mounting pattern and crankshaft flange as an LS V-8, which makes it compatible with a range of existing GM transmissions. 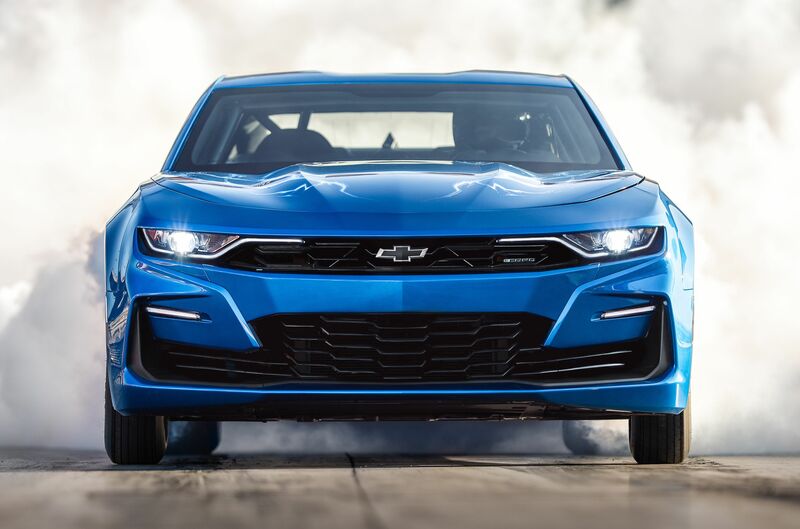 For those favoring internal combustion (and more immediate gratification), Chevrolet will build 69 examples – the same number of ZL1-powered COPO Camaros assembled in 1969 – of its 2019 COPO Camaro. 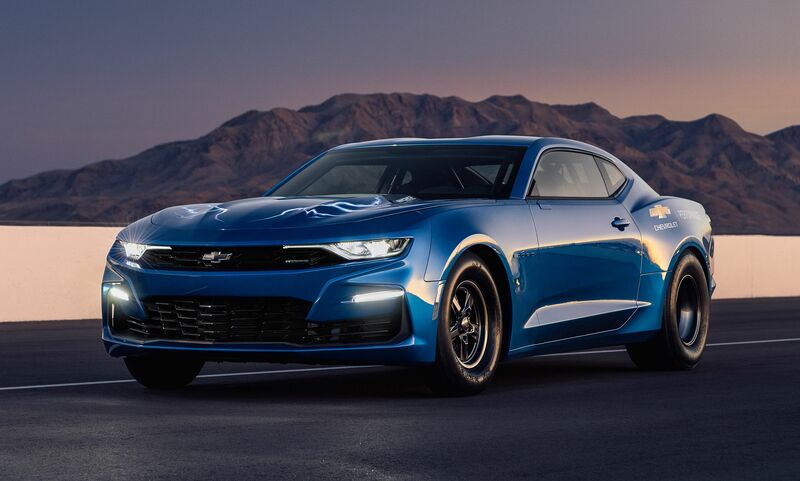 Since demand will far outstrip supply, interested buyers must register with Chevrolet Performance to be selected to purchase a 50th Anniversary COPO Camaro. Once chosen, buyers can opt for one of three engines, including a normally aspirated 302-cu.in. V-8, a normally aspirated 427-cu.in. V-8, or a supercharged 350-cu.in. V-8. 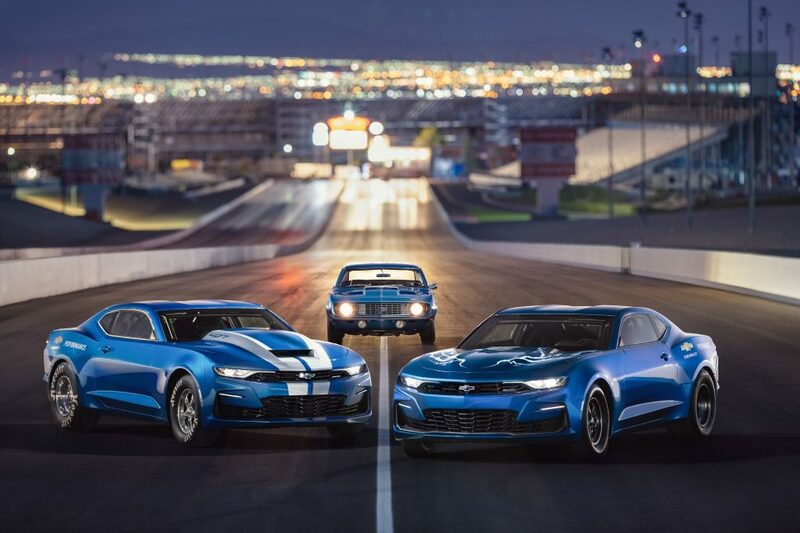 The 2019 50th Anniversary COPO Camaro (L), a 1969 COPO Camaro, and the eCOPO Camaro concept. Pricing for the 2019 COPO Camaro has not yet been announced, but earlier examples have been priced at roughly $90,000 and up, depending upon engine choice and options. For additional information, or to register a purchase interest, visit Chevrolet.com/Performance/COPO-Camaro.